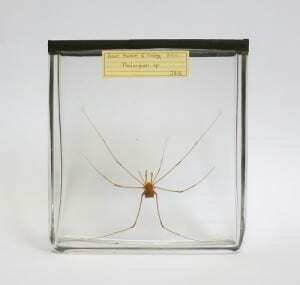 -Harvestmen make up the third largest order of arachnids, the Opiliones, which comprises over 6500 described species to date. As is often the case with invertebrates, species are still being discovered and it is thought that the actual species number could be well beyond 10000. Harvestmen have a wide distribution and are found in every continent except Antarctica (plenty to go around, no need to jostle). Fossils of a great similarity to modern harvestmen are known that date back to the Early Devonian 400 million years ago; they are truly good at what they do and in all that time their body plan has hardly changed… after all, why fix it if it ain’t broke?. 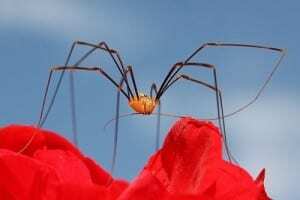 -Similarities between the Opiliones and spiders stop at the legs, quite literally, given that the harvestman’s body is made up of apparently single unit, whereas in spiders the body is separated into the cephalothorax (the front bit, made up of the head and thorax) and the abdomen (the back bit). 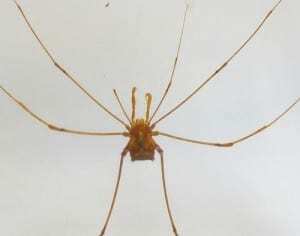 In truth, the body of a harvestman is still separated, only that the join between the cephalothorax and the abdomen is wider, giving their body its characteristic oval shape. 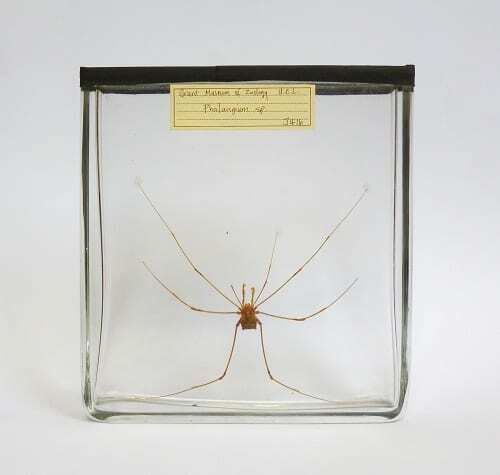 Harvestmen are also lacking in the web spinning department and do not have a spinneret with which to produce silk, unlike the spiders, which (as is commonly recognised) are significantly un-lacking in the web-spinning department. -Harvestmen sometimes exhibit gregarious (or social grouping) behaviour, forming massive temporary colonies, of which have been recorded to be over 70000 strong. These aggregated clumps are typically found in the overhangs of rocks and within the joints of trees. By lifting their skinny legs to the heavens, harvestman groups can form an insulative layer to divert the flow of wind and conserve moisture. This display is adorable, albeit a little creepy and probably more comparable to a seething mess. Harvestman (Opilio canestrinii) by Charlesjsharp. -Harvestmen are wonderfully caring fathers, in fact, the first recorded example of paternal investment in arachnids belongs to that of the neotropical species Zygopachylus albomarginis. This father builds an open-topped mud nest in which he guards fertilised eggs. Over the course of his life, he will graciously tend to this nest, keeping it clean from fungal infection and repairing it if needs be. This species also has a complex courtship ritual in which a female selects a suitable well-kept nest and dances by leg tapping with its owner before fertilisation. Strangely, as if in protest, nature has balanced all this charmingness out, since this species also readily expresses egg cannibalism (but we’ll be setting that mishap aside because I want to make them seem cute). -Finally, a harvestman features in Salvador Dali’s painting Daddy Longlegs of the Evening- Hope, a work bridging both Dali’s surrealist and classical periods. Painted in 1940, this grim piece reflects the apocalyptical landscape and ongoing horrors of WWII that Dali escaped from. Holding steady at the centre, swarmed by ants and missing a leg (just like this specimen), is a harvestman, symbolising hope amidst the rampant decay. This symbolism emanates from an old French peasant legend that the sighting of a harvestman during the evening brings good fortune. Interestingly, this isn’t the only folklore to suggest that harvestman were once considered a good omen; in Turkish its common name, ‘mῡfdeci’, translates as a ‘person who brings good news’. Rowan Tinker is Visitor Services Assistant at the Grant Museum of Zoology, and a UCL Natural Sciences student.